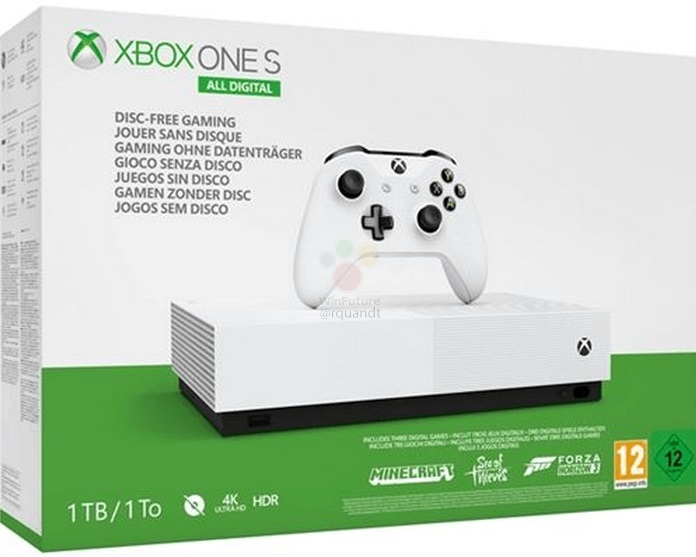 The purported box for an “All Digital” Xbox One S.
on Microsoft’s plans for a disc-free Xbox One S option, new reports suggest that new hardware will arrive on May 7 and sell for €229 in Europe. The reported price of €229 would correspond to a price just over $250 in the United States, at current exchange rates. European prices routinely include value-added taxes and other fees that don’t correspond in the US, though. European retailers like GameStop currently charge €299.99 for a 1TB Xbox One S with a bundled game [Update: Amazon Germany currently offers a similarForza Horizon 4 bundle for €199]. that a disc-free Xbox One option could be an attractive option for the significant chunk of players that has already transitioned away from disc-based console games. But for that setup to work, the new hardware has to be significantly cheaper than the more capable disc-drive version. We’re eager to see if Microsoft can deliver on that additional value if and when the disc-drive-free Xbox One S is officially announced.